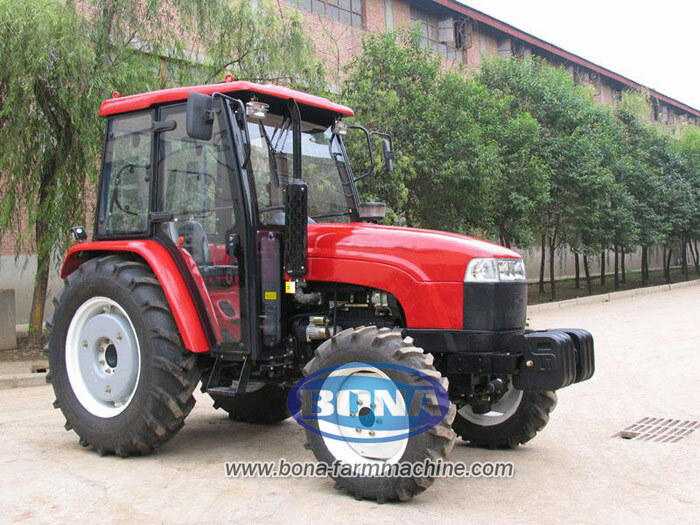 Wheel tractor is one series products that our company is according to market demand and develop,it has the international advanced level of four wheel drive wheeled tractor. It is powerful, excellent performance, handsome in appearance, broad vision, strong adaptability, widely applicable to all kinds of farm work and transportation and other operations. The New HP Series Tractors(eg,40-50HP Tractor,35HP Tractor and so on)powered by the engine, are not just tractors(small tractor) to help you get through the day, they are a blend of iron and intelligence designed to help you take control of your day and your business. Better still they do it all with more power and less fuel consumption than ever before. *Transmission speed range, maximum speed can reach 40km/h, wheelbase adjustable, can meet various demands. *Pneumatic foot pedal operated single main clutch and electric hydraulic control multi disc wet power output clutch. *The fully enclosed cabin, handsome in appearance, broad vision, heating and ventilation, and optional air conditioning, CD machine; hydraulic damping elastic suspension adjustable seat, ride comfort. *Differential lock, using electro-hydraulic control. Hydraulic steering, brake, flexible operation of the light, reduce the work intensity of drivers. *The hydraulic system can be divided into oil structure; configuration 2 sets of hydraulic output, optional 3 sets of hydraulic output; also optional pressure buried structure.